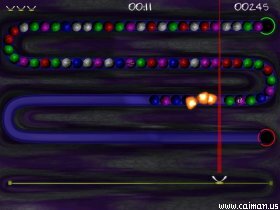 Caiman free games: Zaz by Remigiusz Dybka. Arrange 3 or more balls next to each other. Great game!! 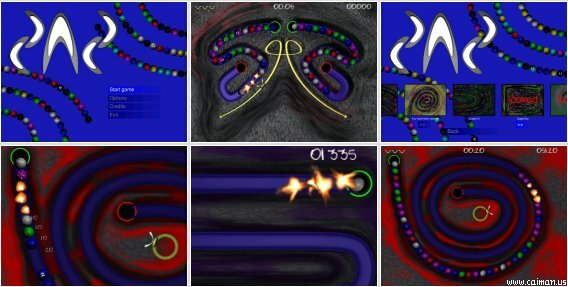 Conception of this game is not completely new. 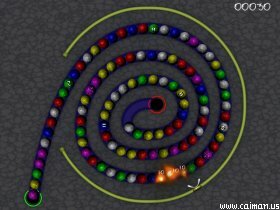 It is bubble puzzle clone, with some unique ideas and some borrowed from well known commercial game. While game title abbreviation suggest otherwise "Zaz ain't Z***". Bubbles ant shooter (you) can move in designed roads (lines). You lose, when bubbles reach hole in the end of line . Unlike in some other games you do not automatically get balls at your shooter. You have to take them yourself and than shoot next to same color. You may earn special items (better aim, roll back lines of balls or stop lines of balls.) if ball with sign is destroyed. Authors homepage and download (install) 35,7 MB.